Our Collaboration Councils are an Exciting and Unique Joint Labor-Management Partnership to Improve Quality Care and the Patient Experience Through Frontline Doctor Engagement with Hospital Administration Across the Health System and at Each Hospital and Facility, Benefiting Our Patients and the Communities We Serve. As part of our strategic path to improvement of care and services, we have focused attention on an essential element of that strategy: enhanced doctor engagement. The creation of a collaborative, learning environment that contributes to strategic patient-focused improvement is a strategy to a continuous learning environment. Our employers and health systems frequently partner with the physician members of Doctors Council. Because of the shared belief that input from frontline clinicians into decision-making is essential and that high clinician engagement and professional satisfaction improve patient care, the health care system and Doctors Council agreed to form Collaboration Councils to conduct quality-improvement projects and identify needed educational programs. One Collaboration Council project focused on reducing patient wait times, thereby improving patient experience and doctor morale. 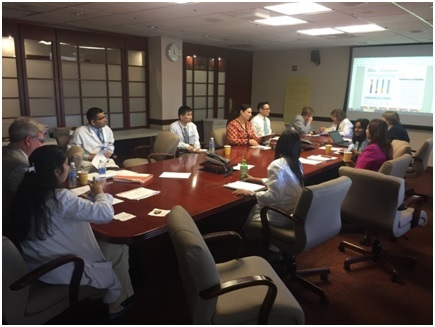 Doctors Council members gathered data about patient experience and the department’s process for patient intake. The team’s first proposed changes did not achieve the desired results, so the team tried again with a new process and significantly improved the department’s wait-time scores on a patient-satisfaction survey. Our cooperative projects, developed through a stable collective-bargaining relationship, depend on a collaborative culture between labor and management. These projects have produced significant, measurable benefits for patients. A Collaboration Councils meeting has Doctors Council members meeting monthly with the hospital CEO, CMO and other administration to work on projects, review data, receive important information and provide critical feedback and input.